Linda Burton posting from Arkadelphia, Arkansas – Napoleon once claimed this land, and sold it to Thomas Jefferson, but guess what, it’s mine now. I’m talking about my little half-acre of the world here in Arkadelphia; take note, I’m a homeowner now. There is a document dated March 31, 2016 recorded in the Clark County courthouse that affirms title to a particular piece of land in my name; ah, land, the bottom-line definition of commitment. For land is our most basic resource; from land comes security. Explorers have roved the world for land, wars have been fought over it, treaties governing its use have been signed, and sometimes, ignored. Surveyors sectioned newly-claimed land into measurable pieces, and realtors make a pretty good living to this day as people trade those pieces, back and forth. As for me, I just wanted to hunker down in peace and quiet, to paint-up fix-up as I please; even the vagabond in me needs a place to call home. But who, I wanted to know, lived here before me? Our Clark County Historical Museum has fragments of Caddo Indian pottery on display from earlier times; the path to the Ouachita River bluff has interpretive markers that tell of Caddoan life here a long, long time ago. Before, well, you know, before they had to leave. A marker alongside the Caddo River (four miles from my house) tells of Hernando de Soto’s visit in 1541, so, I’ll begin there, because his is the first written history of the area. The land now known as Arkansas was populated by thousands of Indians when de Soto arrived. Agricultural fields stretched far with plantings of corn, and beans, and squash. Game and fish were plentiful and surplus goods were traded between communities. Salt making was an important industrial activity – archaeologists have excavated a Caddo Indian site near my house where briny spring water was boiled in shallow pans. Natives lived in square houses with clay-plastered floors and thatched roofs. de Soto crossed the Mississippi River in the spring of 1541, bringing with him an army of more than 600 soldiers, war dogs, horses, and droves of live hogs (the beginnings of our Razorback nation!). He also brought disease, disruption, and devastation. Spanish swords and crossbows were brutal; so were the armored horses and dogs. Terrorism, 1500s style. Did any of that happen in my backyard? It could have, I think, as I look out my kitchen window at the flash of red in the hackberry tree; it’s just the cardinals, looking back at me. Fast forward to the 1600s and the French. Marquette. Jolliet. 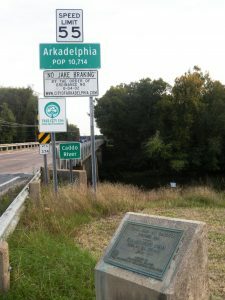 And, in summer of 1686, the establishment of Poste aux Arkansas – a French Canadian settlement on the Arkansas River near its confluence with the Mississippi. It remained an active trading and military post until You Know Who bought it in 1803. Just think about that: Arkansas never had any connection to George III of England, the last king who ruled over my half-acre was Carlos IV of Spain! And then that Emperor fellow, Napoleon. 1803 – my land became part of the United States, a mere dot in the vast unknown of the Louisiana Purchase. 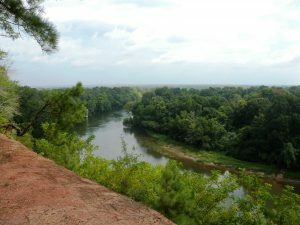 Exploration began; the Dunbar & Hunter expedition for Jefferson traveled the Ouachita River in a flat-bottomed barge, I can look down on their route from the bluff near my house. 1819 – my land became part of Arkansas Territory, with Arkansas Post as its capital. 1836 – my land became part of the state of Arkansas, with Little Rock as its capital. In between those years, and even after, was “Indian resettlement” to make room for white settlers, or sometimes, other Indians. Indian relocation in and through Arkansas lasted through the terms of nine presidents; tribes involved in addition to the Caddo were Cherokee, Chickasaw, Choctaw, Creek, Delaware, Osage, Quapaw, Seminole, and Shawnee. In the midst of that commotion, Jacob Barkman quietly slid in. A young man from Kentucky, he selected a homesite on the Caddo River in 1811 and began trading with the Indians for land. He cleared and cultivated his land, and in 1823, when the US land office opened in Washington, Arkansas, began purchasing more, in his lifetime acquiring about 22,000 acres. And that is where the documentation for my land begins. 1845 – Certificate 4747, dated May 1, 1845, and signed by President James K Polk, “does give and grant” the section of land I live on now (and much more) to “Jacob Barkman, and his heirs and assigns, forever.” I have a copy of that document and all the others that follow. 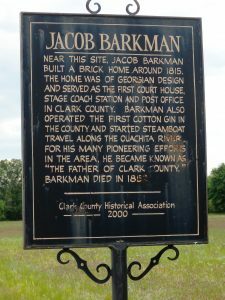 That segment of land stayed in the Barkman family until 1920; passing to son James E M, and then grandsons James and Walter. 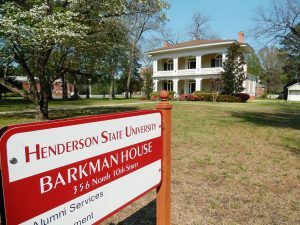 The James E M Barkman house (built in 1860), beautifully restored and maintained by Henderson State University, is across the street from my half-acre. 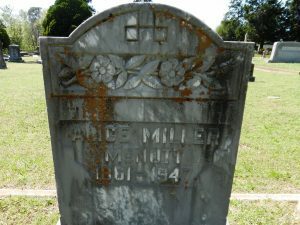 Walter sold two parcels to Nannie Miller in 1920; she sold them to her sister Alice Miller McNutt in 1923. When Alice bought the property, it was undeveloped land. She built two houses – one wood-frame one-story to live in while she built the larger red brick two-story next door. Her life-tale is worth a book in itself (which I plan to write! ); she was a “flipper,” building and selling five super-fine houses in Arkadelphia after being widowed and finding that her husband left most of his fortune to his children by his first wife! Alice sold the new wood-frame and red-brick houses to H A Ross, the town physician. 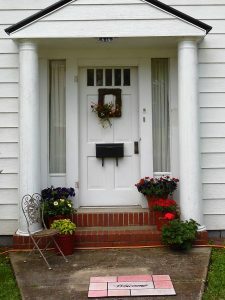 The Ross family used the little white one-story to house various relatives but occupied the red-brick house from 1925 until Dr Ross died in 1944, leaving behind his widow Pamelia and daughter, Ada Gene. After his death his widow moved into the little white house next door, where she lived for the next 29 years. 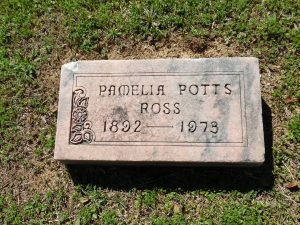 That little white house is my house now, but the gentle spirit of Pamelia Ross fills every room. Pamelia, and Ada Gene. Ada Gene married and moved away for a while; adopted a daughter; moved back when Pamelia became ill. Pamelia left the house to Ada Gene and she stayed, raising daughter Sally in the little white house. 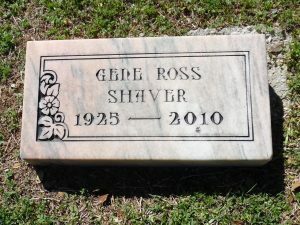 Sally married and moved away; Ada Gene died in 2010. The house was rented to college students until I rented it in 2014; and now, it, and the precious land it sits on, is mine! At least, that is what the deed says. I share it, you see, with Caddo ghosts, and Barkman ghosts, and with Alice, and Pamelia, and Ada Gene. Napoleon, nah, not so much.